In 1931 Our Lord appeared in Poland to a Catholic Nun, Sister M. Faustina Kowalska (1905–1938), in a vision. She saw Jesus clothed in a white garment with His right hand raised in blessing. His left hand was touching His garment in the area of the heart, from where two large rays came forth, one red and the other pale. Jesus said to her: "Paint an image according to the pattern you see with the signature: Jesus, I trust in You . . . I promise that the soul that will venerate this image will not perish. I also promise victory over [it's] enemies already here on earth, especially at the hour of death. I Myself will defend it as My Own Glory. I am offering people a vessel with which they are to keep coming for graces to the Fountain of Mercy. That vessel is this image with the signature: "Jesus, I trust in You" . . . I desire that this image be venerated throughout the world. "My Heart finds joy in forgiveness. I have no greater desire nor happiness than to be able to forgive . . . I cannot punish even the most hardened sinner, if he appeals to My Mercy. He is immediately granted pardon through My incomprehensible and unfathomable Mercy . . . I open wide the doors of My Mercy. Whoever will recite this Chaplet of the Divine Mercy will receive great mercy at the hour of death . . . Even if there were a sinner most hardened, if he were to recite this chaplet only once, he would receive grace from My infinite Mercy . . . I desire to grant unimaginable graces to those souls who trust in My Mercy . . . Through the Chaplet you will obtain everything, if what you ask for is compatible with My Will." I cannot punish even the most hardened sinner, if he appeals to My Mercy. He is immediately granted pardon through My incomprehensible and unfathomable Mercy. Before I come as a Just Judge, I open wide the doors of My Mercy. He who does not wish to avail himself of My Mercy will have to pass through the doors of My Justice. To you Sister Faustina I entrust in God's Name, a gift of My Father, The Two Divine Promises, which will gain for My chosen people a Heavenly Kingdom offered to Me by My Father for those who shall receive it, thanks to My immolation. “When they say this Chaplet in the presence of the dying, I will stand between My Father and the dying person not as the just judge but as the Merciful Savior”. In His revelations to Sister Faustina, Our Lord asked for special prayer and veneration for His Passion at the three o'clock hour, the hour that recalls His death on the Cross. "At three o'clock, implore My Mercy, especially for sinners; and, if only for a brief moment, immerse yourself in My Passion, particularly in My abandonment at the moment of agony. This is the hour of great mercy . . . in this hour I will refuse nothing to the soul that makes a request of Me in virtue of My Passion. As often as you hear the clock strike the third hour, immerse yourself completely in My Mercy, adoring and glorifying it; invoke it's omnipotence for the whole world, and particularly for poor sinners; for at that moment Mercy was opened wide for every soul. In this hour you can obtain everything for yourself and for others for the asking; it was the hour of Grace for the whole world - Mercy triumphed over justice . . . "
"Speak to the world about My Mercy . . . It is a sign for the end times; after it will come the Day of Justice . . . You will prepare the world for My final coming . . . Tell souls about this Great Mercy of Mine, because the awful day, the day of My Justice, is near." "Before the Day of Justice, I am sending the Day of Mercy . . . I am prolonging the time of Mercy for the sake of sinners. But woe to them if they do not recognize this time of My visitation . . . While there is still time, let them have recourse to the fount of My Mercy . . . He who refuses to pass through the door of My Mercy must pass through the door of My Justice." To Sister Faustina, Jesus entrusted the Two Divine Promises. 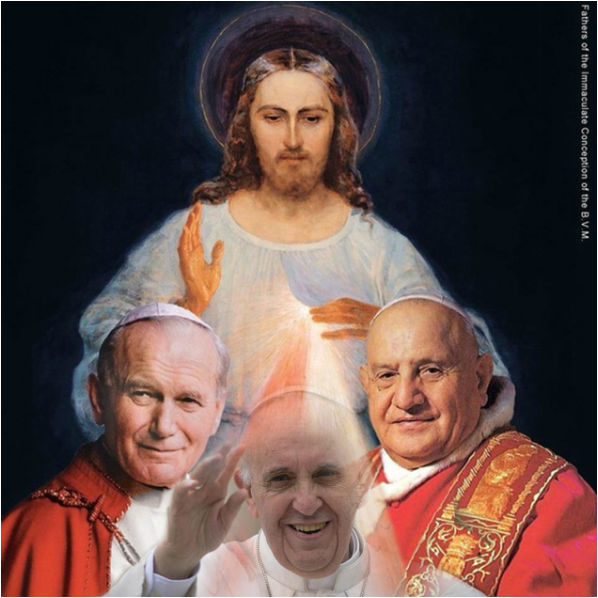 The Two Divine Promises are a bonfire of God's Immense Love, emerging from Polish soil, which will set the entire world on fire and prepare the human race for the Final Coming of Christ. (Please see 'The Two Divine Promises' segment). He said to Sister Faustina. "To you I entrust in God's Name, a gift of My Father, The Two Divine Promises, which will gain for My chosen people a Heavenly Kingdom offered to Me by My Father for those who shall receive it, thanks to My immolation." Like other previous jubilees, it will be a special, holy year of remission of sins and universal pardon, in this occasion focusing particularly on God's forgiveness and mercy. It is an extraordinary Jubilee because it had not been predetermined long before; usually ordinary jubilees take place every 25 years. In fact, the 2016 Jubilee was first announced by Pope Francis on March 13, 2015. It is the 27th Holy Year in history, following the ordinary 2000 Jubilee during John Paul II papacy. The opening day will also be the fiftieth anniversary of the closing of the Second Vatican Council. In prior months it was stressed that the Pontiff wishes the Jubilee to be celebrated not only in Rome but in all local churches around the world: for the first time holy doors will be open in single dioceses, either in the main cathedral or in local historical churches. It was also announced that all priests will be allowed to grant absolution for abortion, which outside North America, is reserved to bishops. Pope Francis has announced an Extraordinary Jubilee of Mercy in the Universal Church. This Holy Year of Mercy will begin on 8 December to commemorate both the Feast of the Immaculate Conception and the 50th anniversary of the closing of the Second Vatican Council, which called the Church to proclaim the Gospel to the world in new ways, bringing God’s mercy to everyone. The Year will conclude on 20 November 2016. In the document, Pope Francis says the Holy Year is “dedicated to living out in our daily lives the mercy” which God “constantly extends to all of us.” He explains the year will begin on 8 December to commemorate both the feast of the Immaculate Conception and the 50th anniversary of the closing of the Second Vatican Council, which called the Church to proclaim the Gospel to the world in new ways, bringing God’s mercy to everyone. To read the Bull of Indiction for the Year of Mercy please click here.